Having arrived and settled in, it was time to delve into the many charms of festival life. While the previous-post was more or less a chronological description of events, this post will be disjointed, discussing general aspects of the afore mentioned festival life in Denmark. I am sure a lot of the festival-attendees would claim to live on the artistic satisfaction, joy, pleasure and cultural nourishment that is achieved through creating music, but if you decide to push the point, or if they are hungry, most of them would also admit to needing actual food. 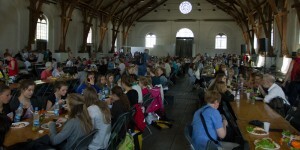 At a catered festival as large as this choir-festival there are a lot of mouths to feed. I was therefore cautiously sceptical of how meal-times would play out. The first dinner seemed to validate my scepticism. Before the opening concert on Tuesday we were all very hungry and needed to eat. Using our collective sense of smell the choir walked hungrily towards the building in which people seemed to be eating, Ridehuset, or, “The riding house.” At the door we were politely told to go away and eat where we were supposed to eat, in a nearby building called the “red pavilion.” We then set off, much like a flock of happy sheep, to the red pavilion. Imagine our shock, dismay, disappointment and deflation at discovering there wasn’t any food there and being told to go back to Ridehuset. With an air of children having been denied their strawberry and chocolate ice-cream with sprinkles on the top we walked back to Ridehuset, and were admitted after some polite discussion. Ridehuset turned out to be a huge hall with hundreds of metres worth of long tables in it. It was also almost empty. Our ancient survival-instincts led us in the direction of the serving-place in the corner. Having picked up our takeaway-boxes consisting of overcooked noodles with some meat unenthusiastically slobbered on top of them, we politely asked a guy who seemed like he might be in charge which one of the tables in the huge empty hall we were permitted to occupy. We were told to take our food and go back to the red pavilion. To summarise, the first meal was not exactly ideal. Luckily this turned out not to be at all typical of the festival. Sure, there were a few minor problems when over 150 people tried helping themselves to a buffet at once. Apparently some choir-people just don’t know how to conduct themselves when queuing. (conduct themselves… get it? get it?) However, overall the meals all turned out to be a lot better than I expected them to be. Despite the few hitches here and there, meal-time became something to look forward to. A thing one does at a choir-festival, apart from eating, is sing. Whilst in Denmark I was part of two lunch-concerts with Cantus Aeterna, and a workshop with Nordic (read: mostly Finnish) music along with all the other youth choirs. Before the workshop commenced we were curious as to what it would be and how we would find it. Would the music be simple? Would the workshop be boring? Would we be allowed water? Having stumbled into the Rythmical Hall we were greeted by our conductor for the week, Mr. Pasi Hyökki. Now, this is very hard to describe, but there is something inexplicably charming about hearing Finnish people speak English. Don’t get me wrong, their English is very good, but there are certain consistent intonations which just makes one want to go ”d’awwww”. Of course, in addition to being Finnish, Pasi was also a great conductor, and has also won awards for it according to a brochure we were given. When he is not conducting choirs he is a professional within the field of singing soprano. Then we had a look at the music. A lot could be said about the music, but some of it was close to the most difficult music a lot of us had ever seen. And most of us have seen quite a lot of difficult music. There was a “Nordic Suite” by Bo Holten which included melodies from Sweden, Denmark, Finland and Norway. The tune from Norway, and the conclusion of the piece was “Pål sine høner”, in English: “Pål’s hens”, a traditional Norwegian song about a guy losing his hens, the hens getting eaten by a fox, and his parents getting angry at him, which I can’t help but think was arranged a little sarcastically by Bo. Pasi The altos to my right trying their best to sing approximately the correct notes, at approximately the right time while trying to pronounce Finnish. Sarcastically arranged, fancy-sounding, Norwegian folk-tunes for 5 voices? I loved it. 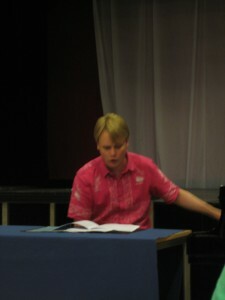 Apart from the Nordic Suite there were also other pieces in Finnish and Danish. Singing in Finnish was an… interesting… experience, especially as we had to sing at a rather breakneck speed. Despite no one knowing anything properly, the workshop concert on Saturday was pretty good, and more importantly, really fun for those of us who sang in it. A lot of credit has to be given to Pasi Hyökki for navigating over 100 singers through all the pieces in only three days, and making the concluding concert sound really good. As for the concerts with Cantus Aeterna, they were fun as always. There is this really amazing feeling one gets when one feels like one has just been part of a great concert, and one feels the audience really likes it. As has become a habit with Cantus Aeterna concerts, I got those feelings after both concerts. The first concert was held in århus cathedral, a very, very, very long church. Imagine you have a cup of normal church-acoustics. Then those acoustics are echoed through another church. Then again through another church. That is what the acoustics in the Cathedral are like. The second concert, in St. Pauls Church, was Cantus’ last concert (for now). My feelings about it were rather mixed. On one hand the concert was great, the audience loved it and gave us a standing ovation. On the other hand, it made me realise more than ever how much I will miss the choir. At the last social gathering in Ridehuset one of the people in charge joked along the lines of: “And let’s all thank the staff of the cathedral and other churches, for doing their part in giving us this fantastic weather!” And the weather was fantastic throughout the week. Brutal, but fantastic. Based on the week we had one could be forgiven for thinking one had accidentally travelled to Spain, or as I put it to some Finnish singers, for thinking one had walked into a giant sauna. I found it a little too sizzling, but I am sure the majority quite enjoyed it. Once again I am running long, so this concludes part 2. Stay tuned (using a fork if required) for the third and final part in which Uranienborg Vokalensemble almost wins a competition, I actually speak to people and I attempt to explain why singing in a choir is probably one of the most fun and enriching things one can be a part of. Photo by Jacob Mathiasen taken from here.